Home » Posts tagged "Virginia"
Ah, Bob McDonnell, the once and former future Vice President of These United States. Now a retired Governor of Virginia and (as of today) 11-times-over Federal convict. His wife was also convicted soundly on similar charges. The Feds were even willing to offer an extremely generous — perhaps overly so — deal to former Gov. McDonnell that would have protected his wife entirely, even though she seems to have orchestrated much of the corruption and solicitations. All he had to do was plead guilty to one felony count and serve time (probably very little considering who he is). Yet he said no. And so down she went with him. But, we were told, it was all part of a cunning plan! This marriage needed to look so awful (for the jury) that refusing to spare her the investigation was just the final step. Mr. McDonnell, who carried his wife over the threshold of the Executive Mansion the day of his inauguration, portrayed her in his testimony as a harridan whose yelling left him “spiritually and mentally exhausted,” and who was so cold that after he sent her an email pleading to save their marriage, she did not reply. BOBBY. FOR SHAME. You made the New York Times editors break out the word “harridan.” They probably nearly asphyxiated from the dust of opening their expanded-volume dictionary just to find that word which could so perfectly summarize your cold-hearted view of your longtime wife and the mother of your five children. BOBBY, I HAD TO LOOK THAT WORD UP JUST TO READ ABOUT YOUR DEFENSE. That is how mean you were to your wife. And how, pray tell, did you brace yourself for your multitudinous convictions, good sir? And the shackles of their love will only grow in strength, no doubt, while they are both shackled in respective Federal prisons. Being apart from an unloving, backstabbing, corrupt spouse can only make the heart grow fonder. That’s in Proverbs. Half Episode due to UD Athletics: An update on the ethics scandal discussion in Ep 50. Michael from Pound 4 Pound Boxing Report talks about the latest Fox News ignorance. Tunisia gets a new constitution. Less than two weeks after turning over the keys to the governor’s mansion, Republican former Virginia Governor and presidential once-hopeful Bob McDonnell and his wife were indicted by a Federal grand jury on 14 felony counts. They somehow managed to run afoul of the (Federal) law, despite their own state’s virtually non-existent ethics laws. Their crimes generally all relate to a scandal involving accepting — or rather actively soliciting — huge gifts from a political donor so the McDonnells could continue living the high life even after their investment portfolio collapsed. They hadn’t even taken office before the shenanigans began (despite repeated warnings from staffers), and they likely wouldn’t have even gotten charged with anything if they had just disclosed it, but they knew it was too politically damaging to admit. So, charged they were — and how. …former Virginia Gov. Bob McDonnell (R) and his wife Maureen were indicted on 14 felony charges on Tuesday. The indictments centered around tens of thousands of dollars worth of gifts received by the couple from a wealthy tobacco executive. In what Republican state legislator Bob Marshall called the “type of activity” that “undermines public confidence,” McDonnell and his family allegedly accepted more than $135,000 in gifts and/or loans from Jonnie R. Williams Sr., the then-CEO of Star Scientific Inc. The McDonnells then helped promote the scientifically-unproven dietary supplements line made by thecontroversial tobacco company-turned-supplements manufacturer. While Virginia’s lax gifts law allows elected officials to accept unlimited gifts — even from lobbyists and those with business before the state — McDonnell apparently failed to fully disclose what he and his wife received. The gifts included a silver Rolex watch, golf clubs, Louis Vitton shoes, and $15,000 to help pay for the McDonnells’ daughter’s wedding. According to the indictment, the former governor and his wife conspired to commit wire fraud to accept bribes, knowingly made false statements on loan applications to avoid reporting the Williams loans, and obstructed justice. Great job to the Washington Post for pushing relentlessly to expose this story. 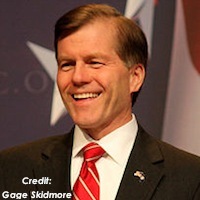 And now — since this is one of those scandals that probably didn’t really truly hurt anyone — the fun begins, particularly because Bob McDonnell was not well liked by much of the nation for his (and his party’s legislative members’) support for aggressive counter-abortion laws, such as the proposed mandatory, highly invasive early ultrasound. This Oscar de la Renta dress costs $12,590, which is just a fraction of the $140,805.46 in luxury gifts federal authorities say former Virginia governor Robert McDonnell and his wife, Maureen, took from a wealthy businessman. Oh, and a word to the wise for successor Governor Terry McAuliffe: Given your own shady ethics, don’t forget to declare the gift you received from the McDonnells when they left. For our initial coverage of the scandal in July 2013, listen to AFD Episode 50 – Ethics, Efficacy, Insurance. I’m still not sure what or who brought it up in the first place, but, having apparently solved all other pressing policy matters in the state, Virginia’s elected officials have in recent years begun debating whether or not public school textbooks in the state should refer to the body of water between Japan and the Korean Peninsula as the “Sea of Japan” or the “East Sea” or both. The South Korean government believes the name “Sea of Japan” is an offensive remnant of Japanese imperialism, including the period in which they brutally occupied the Korean peninsula (thus holding the territory on both sides of the sea). They want people to call it “East Sea” (their northern counterparts say “East Sea of Korea” but no one listens to them), though they are willing to compromise and call it both. And for some reason, a lot of state officials in Virginia seem quite persuaded that this South Korean view is the right position. This is happening, despite, as far as I can tell, it having nothing to do with anything, from Virginia’s standpoint. So Virginia would be going against the view of the U.S. government (rather inexplicably) and against the recently renewed directives of the International Hydrographic Organization, the official international body that decides what to name bodies of water — though, to be fair, the latter was originally set when Korea was occupied and could not challenge it. McAuliffe’s Republican rival, Ken Cuccinelli, also sent a letter to the VoKA last month. Yes, that’s right, both candidates took the time to endorse a position (the same one, even!) in this issue, which has no substantive impact on anything in Virginia. With McAuliffe now in office — though it would not, I guess, have made any difference on this particular issue — the very-non-Korean legislators are forging ahead on their proposed law for using both names in the textbooks. This in turn has brought upset Japanese government lobbyists down from Washington D.C. to Richmond to advocate against the change (without much success so far). To my mind, Virginia’s obsession with this “issue” defies virtually every “law” of American political science. It doesn’t affect voters, there’s probably not a lot to be gained from it, and it wouldn’t seem like something either voters or legislators would care about — yet somehow they keep bringing it up in session and on the campaign trail. Where will it end? Is it just a weirdly minute way to stick it to the United States government and assert Tenth Amendment rights? Interestingly, the naval base in Virginia would, of course, still be using the U.S. military’s labeling, even as schoolchildren learned a different labeling. In any case, I don’t really have an opinion on this issue one way or the other. I just find the fixation in Virginia a bit intriguing and odd. Bill and guest co-host Sarah discuss Virginia ethics scandals, Alan Grayson’s effectiveness, John Boehner’s ineffectiveness, Indiana’s insurance rates, and Arizona’s expansion of Medicaid.